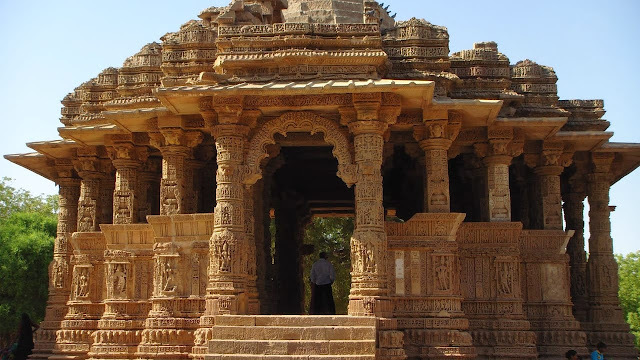 Modhera Surya Mandir is built in Modhera Village 30 kilometre away from Mehsana District and 34km from the Patan in Gujarat. The Modhera Surya Mandir is a unique example of eccentric architecture and craft art. Lime has not been used anywhere to add to joint the rocks in the construction of this temple. Built-in Iranian style, this temple was built in 1026 AD by Bhimdev I, King of Solanki dynasty in two parts. In which the first part is of the sanctum sanctorum and the other is the hall. The inside length of the sanctum is 51 feet, 9 inches and width is 25 feet, 8 inches. There are a total of 52 columns in the shrine of the temple. Apart from the paintings of various gods and goddesses on these pillars, the events of Ramayana and Mahabharata have been shown with the finest workmanship. Looking at these columns below, they look like this octagonal and looking upward. The construction of the temple was done in such a way that on the sunrise, the first Ray of the Sun illuminates the sanctum of the temple. Next, to the hall, there is a huge Kund which is famous as Suryakund or Ramkund. Solanki kings were Suryavanshi and worshipped the sun as a totem That is why he decided to build this magnificent Surya Mandir for the worship of his primordial god, which led to the formation of the Sun Temple of Modhera(Modhera Surya Mandir). During the invasion of alien invaders, the temple was greatly damaged during the invasion by Alauddin Khilji. He also broke the statues of the temple, that is why it is forbidden to worship in this temple at present time. It is believed that the attack by Alauddin Khilji had broken the temple. Filed under this, the Archaeological Survey of India has taken this temple under its protection. The temple of Modhera has been mentioned in many Puranas. Like Skanda Purana and Brahma Purana, which has been said that in ancient times, the entire area around Modhera was known as Dharmaranya. According to the Puranas, it is also said that Lord Shri Ram told to tell his master Vasishta a place after Ravana's death, where he could do self-realization and get salvation from the sin of killing Ravana. Then the master Vasishtha advised Shri Ram to come here.